So i save a bunch of talents and gear sets, but when i click it, it only equips the new gear, doesnt switch specs. Also Going into different specs removes the talent sets. And Learn / Save are never highlighted. Off topic question, how do i make it when i switch specs certain bars stay in ElvUI? LDB shows up on ElvUI's built in Data Broker piece but fails to update until you reload UI. Was working until about 2 weeks ago. I see no actual LUA errors pop up (and I do have that enabled), just that it does not update. after searching for "Able to adjust talents"
Awesome addon, I use it all the time. Thanks for your hard work. 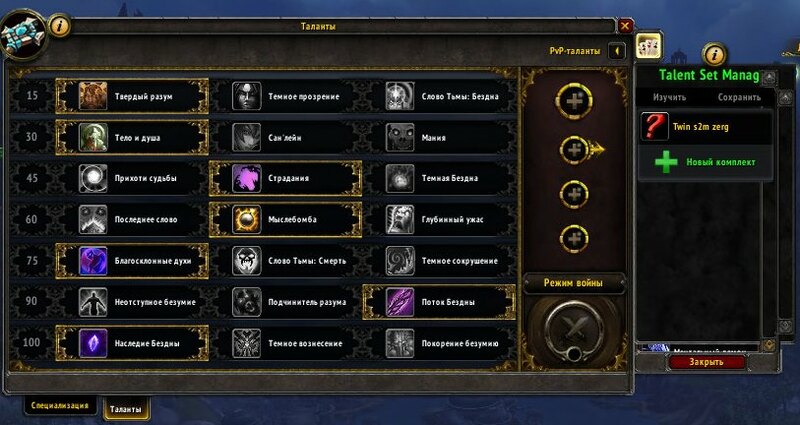 Are there any plans to add a way to save/switch the new BFA pvp talents? That would be awesome! Thanks! Hey, Talent Set Manager doesn't seem to be loading at all the past couple of days. With 8.0.1 I am currently unable to Save or Learn any talent sets. My main characters who have already saved talent sets in the past can do so still but new max toons that I am trying to set up talent sets with I cannot do. The buttons for Learn and Save are not highlighted at all. +1. I can save but as soon as I learn another Talent Set it overwrites the previous as well. Edit: This only happens as fury. When i try to use a Tome of the tranquil mind. This error also occurs during battleground preparation. Trying to update the TalentSetManager.lua but it give me an error. Im pretty sure i have done something wrong. Not the best when it comes to things like that. Any chance you can paste the lines thats changed in your TSM file to me? My full TalentSetManager.lua looks like this. I can swap my talents with the addon in town but I get some errors when trying to use it with tome of the tranquil mind. Badly needs an 8.0 update ASAP. I play two warlock specs and talent-switching is very frequent in raids. Saving my builds was extremely useful and I didn't know how badly I needed it until it was gone. I can't stress enough how much I rely on this add-on to make my life easier. Please, I'm begging you, give us an 8.0 update.